We conduct a twice annual review of learning from research journals, partners, competitors and clients / client projects. One theme which emerged from the clear majority of clients is the difficulty in getting sales people to use CRM systems. We have looked at successful projects and current research to bring you some insights into this challenge. We are indebted to Brandon Bruce for writing a very short but punchy and useful book entitled “The Shelfware Problem: A Guide to CRM adoption”. The term “shelf ware” sums up the problem beautifully. The author quotes 2 hard hitting statistics: Gartner projects the CRM market value will be £36 Billion in 2017, while Forrester Research found that 49% of CRM projects fail. That’s a lot of cash wasted! The upside for CRM is massive: Customer insight, pipeline management, forecasting, internal co-ordination, performance coaching – the list goes on. So, what can we do to make it work? Here are 4 hacks to help! Many complaints we heard were along the lines of “We can’t trust the data sales people enter…” or “what will we do if sales people leave with their customer contacts not in CRM?”. The focus here is on what management get. We rarely heard clients say, “We are concerned if our CRM helps customers” or “The CRM is not helping sales people coach themselves”. In other words, the CRM was designed with only management in mind. As far back as 2009, Boujena et al, showed that customers can value good CRM, (Journal of Personal Selling & Sales Management) and yet very few systems seemed to be designed with customers in mind! Ironic, considering the “CRM” acronym! There are 3 vital stakeholder groups in CRM. Can a sales person get really useful insights into how they can be more effective? Save time? Prioritise which customers to work with? Can a customer ask a sales person what’s happening about their order, and get an instant, useful response during a meeting? Can managers get a good view of the opportunities in play and support them accordingly? Improvements can be made by changing reporting, data fields or derived data to add value for each group. If you are lucky enough to be scoping a CRM now, make double sure you really dig into what each stakeholder group will value. What does CRM adoption actually mean? Brandon Bruce makes the point in the book that we should take care in measuring adoption. Do we need every field, including the FAX number to be filled in for 100% adoption? Wasting sales people’s time to collect data is, well, a waste of time! Instead, we should be focusing on the measures that really matter and adapting as the system evolves. This means going out to listen to sales people on the ground: What is working? What is causing frustration? Who is using the system the most? Why? Reflect for a moment on the training that the sales team had. Firstly, did they actually have good training? Were they left to get on with it? If they did have training, how engaging was it? And has follow up training been provided? We cannot expect people to use a system they don’t understand. Ongoing training is vital, but watch out for whole day sessions with 80 PowerPoint screenshot slides: Who’d be motivated by that? Today we have lots of ways of delivering training which is more valuable at point of use: Videos, virtual classrooms, FAQs, podcasts etc. 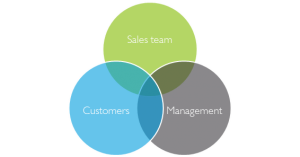 And competitions can be used to encourage sales teams to change behaviour regarding CRM. Why not include 1-hour refresher training in sales meetings, followed by a competition to add leads and contacts in the shortest possible time? Research by Widmier et al in 2003, published in the Marketing management journal, discovered the importance of using champions within the sales-force to drive adoption. Respected peers make for much stronger influencers than distant managers in HQ. Involving key sales people in the planning and implementation of CRM pays dividends. Why not ask these people to deliver training to their peers? Train them to be superusers so they can field questions about CRM from their peers. Imagine an engineer today going to their employer saying, “err please can I use paper and ink pens to design part of the new product?” They would be laughed out of the building. CRM is the sales profession’s equivalent of CADCAM. Every one of our clients without exception uses CRM. Any sales person not using CRM is going to find it very hard to find a new job if they don’t embrace this technology. At the same time, the community of users for CADCAM work together to make it a hugely powerful system that offers much higher value than paper and ink. Whichever stakeholder group we are in, it’s up to us to make our organisation’s system work: It’s at the heart of our competitive advantage.